Along with fireworks and cookouts, the Independence Day weekend saw the introduction of new seatbelt and car seat laws for Georgia children. The new laws were effective on July 1 and will require some Georgia families to dust off booster seats that they thought were no longer needed. 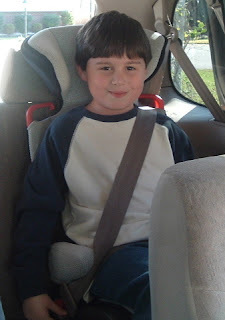 The new law raises the age for which booster seats are required from six to eight years old. Violation of the law is punishable by a fifty dollar fine for the first offense. Subsequent offenses can lead to a maximum fine of one hundred dollars. The Governor’s Office of Highway Safety recommends that young children should be carried in a rear-facing car seat until they reach the maximum weight or height limit for the seat. At that point, they should be transitioned to a forward-facing car seat with a harness until they reach the maximum height or weight for the new seat. When they outgrow that seat, children should ride in a booster seat until they are eight years old or until they are over four feet nine inches tall. In all cases, the child seat must be positioned in the rear seat of the car. There are some additional exceptions to the law. If a child is over forty pounds, they can use a lap belt only if the auto is not equipped with shoulder harnesses or if the shoulder harnesses are being used to restrain other children. The law covers all autos and pickup trucks on Georgia’s public roads except for taxis and public transportation vehicles such as buses. Additionally, children may be restrained in the front seat of a vehicle that does not have a rear seat. Children can also be exempted from the law if they have a written statement from a physician detailing a medical condition. According to GOHS, there were 14,154 children aged six to eight involved in auto accidents in 2008. 1,755 of these children were injured and ten were killed. The GOHS estimates that only twelve percent of these children were properly restrained with a car seat or booster seat. Hospitalization and medical costs for these children is millions of dollars per year. The law has met with some criticism. Some parents have voiced concern that their vehicles cannot accommodate car seats for all of their children. Others have expressed concern that the law should have been phased in gradually because families with children who were older than six may have discarded their booster seats in accordance with the old law and may now have to buy a new one to use for only a few months until their children turn eight. Additionally, children who have become used to not having a booster seat may feel a blow to their pride to be forced back into something that they feel they have outgrown.